He sits, contemplating under the snowy moon. The result of his last skirmish is scattered around him. His clothes are torn and show signs of battle but his body has healed any wounds long ago. His next opponent approaches with silver armor shining in the moonlight. 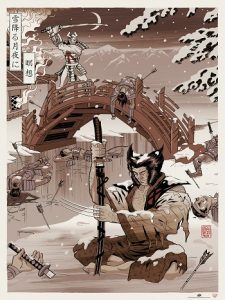 Eastern Woodblock: Wolverine is presented in this 18” x 24” Giclée on Canvas Gloss and is perfect for all Marvel fans new and old. Limited to only 250 pieces this amazing piece is available at http://www.UpperDeckGallery.com for $59.99 while supplies last! In the variant edition, limited to only 100 pieces, the color is muted to a sepia tone to give the piece a more classic feel and bring is closer it’s heritage. 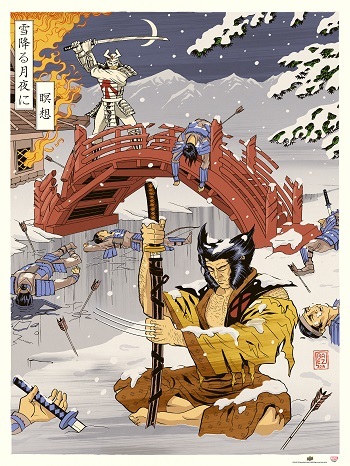 The variant is available for $89.99 while supplies last!